In March 2005 Ethiopia filed US trademark applications for three coffee producing regions, including one used by Starbucks. The aim was to retrieve some of the profits being reaped by distributors by forcing them into licensing agreements. However Starbucks had filed its own application under the Shirkana Sun-Dried Sidamo name the year before, so blocking one of Ethiopia's claims until Starbuck's application had been concluded. Ethiopian specialty beans retail at three times the price of ordinary coffee - and Getachew Mengistie, head of Ethiopia's Intellectual Property Office, believes that is not wholly a result of investment in roasting, packaging or marketing. Some of it is derived from where the beans are grown. 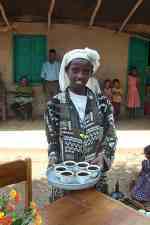 Ethiopia farmers sell a pound of specialty coffee for an average price of $1.45. In the US that coffee is sold by Starbucks for $26 a pound. Most farmers in Fero, where Sidamo beans are grown, live on $120 a year. They live in mud huts, work without shoes and live on the fruit and vegetables they grow. The trademark row is a potential PR disaster for Starbucks, which is in danger of appearing like a greedy western multinational exploiting millions of extremely poor Ethiopian coffee farmers. Last year its revenues grew 22% to $7.8 billion. Around 2% of Starbucks' coffee comes from Ethiopia, according to Fortune. However the coffee chain has invested a lot in CSR. It is the biggest buyer of fair trade coffee in the US - and this has brought some benefits to Ethiopian farmers, such as bringing electricity to their villages. It awards $6.20 per farmer for its premium coffee lines in the Fero region of Ethiopia. But dispute is in danger of posing Starbucks as the villain by standing in the way of the next stage of the fair trade movement, which is trademarking by coffee-growing countries. Oxfam estimates that ownership of the trademark would net Ethiopia $88 million a year, and push up the specialty price per pound by 88 cents. Starbucks claims that Ethiopia would be better off going down the route of geographic certification, which guarantees a product using a regional name actually comes from that area. It would nevertheless enable distributors like Starbucks to use the name in their brand. Ethiopia claimed certification would be too difficult and expensive to enforce in an industry consisting of 2m subsistence farmers. And it would leave the brands in the hands of western distributors. Starbucks dropped its trademark application for Shirkana Sun-Dried Sidamo last June but Ethiopia's claim was thrown out two weeks earlier following a protest letter from the US National Coffee Association trade group, which includes Starbucks. Starbucks denied knowledge of the letter, which successfully argued that the name of the coffee could not be trademarked. In November Starbucks CEO Jim Donald met with Ethiopian Prime Minister Meles Zanawi in Addis Ababa, but they failed to resolve the trademark issue. Ethiopia is appealing the rulings in the US. Ethiopia's Intellectual Property office has nine more types of coffee it wants to trade mark, and other countries might follow suit if it succeeds. Whether it wins or not, it is already beating Starbucks in the crucial PR stakes.